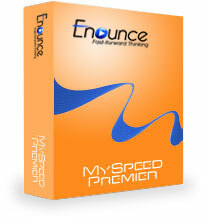 MySpeed Premier lets you view videos from 5 times faster than normal speed to 3 times slower! Also lets you view downloaded Flash (FLV) files offline, so you can also watch videos on airplanes, at home or anywhere! Includes free upgrades. What's the difference between MySpeed and MySpeed Premier? With MySpeed I can learn English, piano and guitar. It´s exactly what I needed. Thanks for this application. (MySpeed)... saves me time when I'm watching long presentations by letting me hone in on the key parts of a speech quicker than I can with the basic control buttons on YouTube. Buy with confidence! If you’re not delighted with your purchase, receive a full refund. Learn more about our no-questions-asked 30-day money-back guarantee. © 2019 Virentem Ventures, LLC d.b.a Enounce, All rights reserved. Enounce and Enounce logo are registered trademarks of Virentem Ventures, LLC. Various trademarks held by their respective owners.